At the Universidad Nacional Autónoma de México (National Autonomous University of Mexico), one of the oldest universities in the Americas, we have a motto that identifies us: “Through My People The Spirit Will Speak”, written by José Vasconcelos, who was rector in 1920. This motto reveals the humanist vocation with which our highest-ranking educational establishment was conceived. Today, having walked a long road, those of us that form a part of the Programa Coral Universitario (University Choral Program) have taken up this phrase, thus saying: “Through My People The Spirit Will Sing”. As in every story, time must pass in order to provide for development and growth. The creation of choirs within the UNAM was initiated in 1964 and continued for close to eight years before lack of interest in continuing the project intervened. Happily, in 1997 this initiative was once again taken up, and the choirs that existed in isolation within the University were invited to be a part of this new program. The task of informing and convincing the authorities in various schools and institutions of the enrichment this activity means for student education continues to be an arduous one. Despite the extent of writings and research done on the benefits of music practice in general and choral practice in particular, in the majority of academic areas the authorities believe there is no time for such activities. We continue to encounter the resistance that promotes ignorance of the numerous benefits choral practice contributes to human education, something which, in addition, has a low economic cost, if we consider that only a single, well-prepared person in front of the group is necessary for things to begin to work. University choirs are places where students learn to see the world in a more complete, diverse and inclusive manner. As a result, they can find perspectives that allow them to enrich themselves as individuals. The sensitive and emotional life of a human being also requires training and education, not only for one’s own benefit, but for the society in which one lives. Music, being a pre-verbal and emotional language, contributes to the formation of a person’s sensitivity, which is of great importance in the construction of a healthy lifestyle. I still believe this is not a matter centered exclusively on economics, though I do, unfortunately, see it has a connection with poverty and ignorance. We find it hard to value the intangible. The pursuit of economic welfare is a never-ending effort. We easily forget that the common good is built upon and includes all of us. As a result, the Programa Coral Universitario is a something of value that we must continue to care for and promote. Our work has continued for seventeen years, and every day this program becomes more pertinent within the UNAM. “To promote creation in the different fields of art and to disseminate cultural and artistic expression in all genres, as well as promoting scientific, technological and humanistic knowledge developed in the university, in order to enrich the education of students, to be of benefit as widely as possible to all of Mexican society, and to strengthen national identity”. [http://www.cultura.unam.mx/secciones/Qui%C3%A9nesSomos] consulted on August 10, 2015. I have had the honor of coordinating the Programa Coral Universitario since 2002, and, thanks to this opportunity, I have been able to compose a team of musicians who are committed to teaching and who are willing to work with choirs, so opening the way to creativity, to cultivating the motivation to join hands and creating spaces that generate identity. In the Programa Coral Universitario team, we encourage and share the values important to living together and building with others in peace. In a Mexico full of contrasts, which experiences extreme and difficult situations, a tool like the PCU must be maximized. Our youth require spaces for expression that allow them to communicate with others and leave the absorptive cyber world and drugs, alcohol, and a sense of emptiness in a world that may become very hostile if we do not present them with alternatives. The Programa Coral Universitario transforms lives and promotes the respect merited by quality choral practice, however simple it may be. Our job is to show members of the chorus the beauty of a simple melody, sung properly as a team. We engage members in the experience of resonating with others, providing for that collective energy to reach an increasingly wider audience and thus encourage the further generation of an audience. It is not a simple task to get people interested in joining a choir. This activity is virtually unknown to most of the population. Promoting, advertizing and publicizing choral activity has been much of my work, not only in connection with the Programa Coral, but for over twenty-five years with Voce in Tempore A. C., an association created primarily for this purpose. 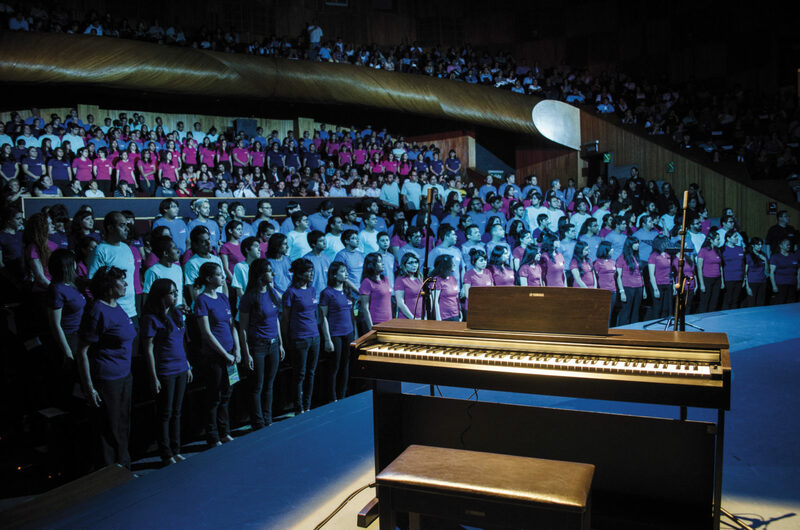 The Programa Coral Universitario now serves thirteen choral groups, totaling approximately 350 choir members. Anyone from the university community can enter a choir of personal preference. We even have space for external persons who wish to participate and who adapt to the conditions of rehearsal. Choral participants are students, teachers, administrative workers, custodial staff and postgraduate or open system students. The range is very wide, and, if we consider that the number of students registered for the 2014-2015 cycle was 342,542, we can say that we have much work to do. The choirs that exist today are from the School of Sciences, dir. Eduardo Hernández; School of Political and Social Sciences, dir. Rodrigo Castañeda; School of Accounting and Administration, dir. Edgar Domínguez; School of Law, dir. Gabriela Díaz and Ivet Guillén; School of Philosophy and Literature, dir. Enrique Galindo; School of Engineering, dir. Óscar Herrera; National School of Social Work, dir. Claudia Salgado; Acatlán School of Higher Education, dir. Raúl Vázquez; Aragón School of Higher Education, dir. Arturo Salvadores; Iztacala School of Higher Education, dir. Luis A. Manzano; Zaragoza School of Higher Education, dir. Arturo Salvadores; and “Voces del CELE” (Center for the Teaching of Foreign Languages), dir. Gabriela Franco. We will soon be forming the Choir of the Cuautitlán School of Higher Education. In general, choirs rehearse four to six hours per week. The program includes teachers of vocal technique who act as advisors to the directors and work with choirs. We also have two pianists who attend to choirs and who accompany works that need reinforcement or works originally written for chorus and piano. Choirs, depending on their musical level, offer concerts in their home areas and also participate in performances outside the University. Each semester, meetings are organized to work with all members from the different campuses, the aim of which is to have choir members hear each other, meet and promote this endeavor. I have been privileged to have the support of great directors who share the mysticism of the work of the PCU and who attend in order to work with choir members and directors. My job as coordinator is to organize choirs, directors and teachers; to talk with the directors of schools and colleges, in order to allow and support the increase of group formation; to justify and make apparent the progress of the Programa in the Dirección General de Música y Difusión Cultural (Directorate General of Music and Cultural Dissemination), so that the budget allocated continues to grow; and above all, to see that this activity remains relevant within the UNAM. Finally, the PCU has achieved a special place, because it is an activity of the Directorate General of Music that caters directly to the university community. I feel fortunate to work for this program and wish, by means of this article, to promote a connection between the PCU and people and institutions interested in sharing similar experiences. We have much to learn and a long way to go. Music is a means to do so. Let us continue to work so that, within the Universidad Nacional Autónoma de México, the community’s voices can be united in dignity through art and the promotion of creative spaces, where generosity and the spirit of growth are practiced, where friendship is cultivated in areas of expression that will leave an impression on those who live it, those who listen and, as well, on our society. 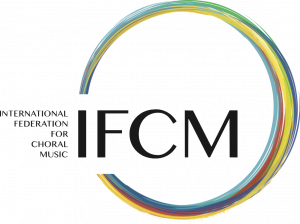 We cannot escape the great responsibility to engage with choral music and what it means for human education.